Welcome to our article on over friendly dogs! In this article professional dog trainer Jo Laurens shares her thoughts on dealing with an over friendly dog. If your pushy dog is accidentally upsetting the dogs he meets on walks, this guide is for you. There is a behavior problem lurking in the dog world, which may not have a name. We’ll refer to it as the problem of over friendly dogs. I’m going to describe it, to be sure you know what I’m talking about! It mainly affects very sociable and friendly dog breeds. Picture the scene: a Labrador is being walked off-leash. Another dog appears. Let’s call her Beebee. The Labrador gallops off towards Beebee, ignoring recalls. Beebee is intimidated by the arrival of this large, highly energetic and excited Labrador who appears like a rocket out of nowhere and surprises her. As the Labrador reaches her, Beebee offers some calming signals towards the Labrador – looking away, or lip-licking. The Labrador takes absolutely no notice. So Beebee actively tries to move away or escape. But the Labrador is so energetic, he moves wherever Beebee goes. The Labrador leaps on Beebee in gleeful, happy enthusiasm, wanting her to play with him. Beebee now has become quite scared and snarks at the Labrador, to try to scare him off. Humans don’t like to see their dogs being aggressive, so now Beebee’s owner tells her off. Was it really Beebee’s fault? Pushed into this position by the Labrador, who failed to notice more subtle canine communication, Beebee had no other option but to escalate the request for space. Do You Have A Bullying Over Friendly Dog? Jean Donaldson, in her book ‘Fight’, describes canine bullies as dogs which ‘bulldoze past the target’s shorthand appeasement gestures and threats and sometimes ignore even the scaled up versions’ (p. 80). These are dogs which find ‘roughness and harassment of non-consenting dogs quite obviously reinforcing’ (p. 17). However, owners usually don’t like the suggestion that their dog is a ‘bully’. Human bullies are thought to be ‘nasty’ and ‘mean’. 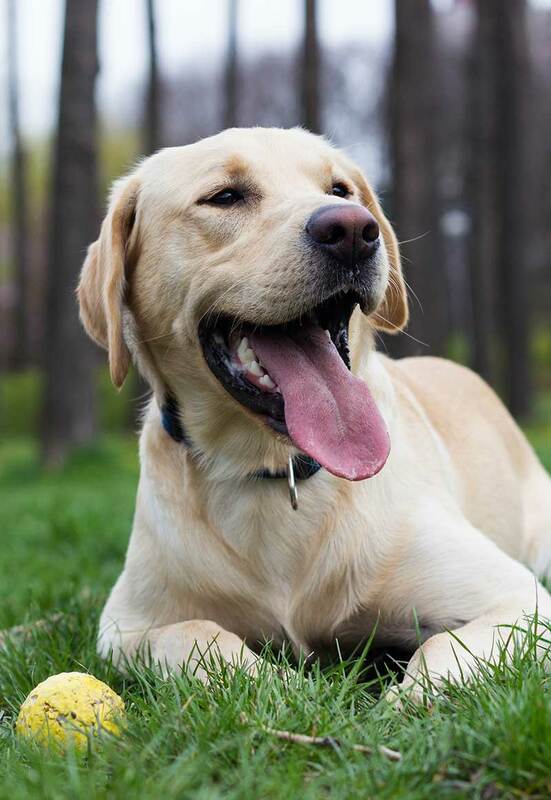 Owners don’t like to think of their dog as ‘nasty’ or ‘mean’: Their Labrador is happy and bouncy and enthusiastic. He means no harm and is not intending to scare the other dog, they think. Most people are embarrassed by their dog behaving this way, while recognizing his good intentions. The term ‘bully’ is a hard one to accept. I realized that using the term ‘bully’ seemed to generate defensiveness and denial when I tried to talk with owners. So I tried to come up with some alternative and more neutral-sounding labels for this behavior. I thought about calling it being ‘pro-social’ or ‘excessively sociable’ or ‘overly-social.’ But nothing really quite fits, and I’m not sure I’m any closer. However, you now know what I’m talking about, because I’ve just described it! What Should Your Pushy Dog Do When He Meets Other Dogs? When the Labrador reached Beebee, if he had good canine communication skills, he would have ‘understood’ Beebee’s request for space. He would have stopped his approach, modified it and reciprocated with calming signals of his own, to echo hers. At that point, Beebee might have been reassured that his intentions were not to squish her. She may have agreed to a calm sniffing meet-and-greet, and then they may have gone their separate ways. Or, the Labrador may have concluded that this dog wants to be left alone and isn’t play material, so he may have decided to leave without meeting Beebee. The problem arises because the Labrador ignores the signals given off by Beebee, and instead imposes what he wants from the meeting – exuberant play – on her. There is clearly a recall problem too – because, if this same dog had a well-trained recall, as soon as he headed off for another dog, he could be successfully recalled from them. However, part of the reason for the recall problem in the first place, is the dog’s excessive interest in other dogs – how motivating other dogs are. If other dogs weren’t ‘amazing’ for this dog, there wouldn’t be such a recall problem around them. So one question is: How does a dog end up being this motivated by contact with other dogs? What happens, in nature or nurture, to ‘grow’ this sort of dog? This sort of behavior is more common in some breeds of dog than others. Labradors, clearly, can be affected by it. But other typically large, energetic, and confident breeds which often love rough play can also have a tendency towards it. But not all examples of the breed behave in this way. Some Labradors have excellent canine communication skills. So what’s going wrong? And how do the owners of young Labradors prevent them from growing up to behave like this? From this point on, there are no known facts. Everything I say is conjecture and opinion! Many Labradors which behave in this way are the only dogs in their households. There is a phrase in dog training, which runs: ‘Deprivation increases motivation’. That is: When a dog is ‘deprived of’ something, the dog’s motivation for that ‘thing’ is increased. The simple example is food: When a dog is hungry, she is more motivated by food as a reinforcer. Exactly the same phenomenon exists when it comes to contact with other dogs: When a dog is deprived of contact with their own species, a ‘hunger’ can develop for this. This is especially the case for a young or adolescent dog. A puppy growing up in a multi-dog household has other dogs around her, all the time. Far from being ‘deprived’ of contact with other dogs, other dogs are available any time, anywhere, for contact. Some of the most valuable ‘learning’, here, comes from just lying down and relaxing with other dogs. Sleeping alongside each other. Being ‘bored and boring’ together! Often dogs out on a walk are therefore only worth a quick sniff and a move on. They don’t become a highly charged reinforcer. Of course play does happen in multi-dog households, but it happens very much on the terms of the older dogs. Not all other dogs want to play. Even other dogs that want to play don’t want to do it all the time. Other dogs can be pretty boring, really. Most of the day, most dogs sleep! Trying to make a dog play and ignoring subtle communication from them results in being told off. Always be polite when trying to elicit play from another dog, and wait to see what the response is: ‘Ask, don’t take’ – and how to ‘ask’. Play ‘with’ another dog, don’t play ‘at’ them. Good play is a reciprocal conversation, not a monologue. Obviously, humans need to supervise all this and not leave it entirely up to the older dogs If a puppy is pestering an older dog, it’s important to step in and give the older dog space from the puppy. These lessons are learned gradually and non-traumatically – not in one display of fearsomeness from an older dog, tired of being harassed. Canine interactions have a large potential vocabulary. Just as a human child learns increasing numbers of spoken words through dialogue with older humans, and becomes more fluent in a spoken language, so a puppy’s vocabulary increases – if she learns from interactions with well-adjusted older dogs and at a young age. A dog which has learned only one ‘move’ with other dogs (run at them and gleefully leap on them), is like a human who can only repeat one word. Jean Donaldson describes this as when a dog becomes ‘a broken record, repeating the same thing relentlessly and often with increasing intensity’ (p. 18). But much of this learning can only occur in puppyhood. Once a Labrador is older, and has missed this window, giving him experience of other well-adjusted dogs often is not enough. Other dogs can attempt to ‘tell off’ the Labrador, but he often ignores it and continues attempting obnoxious behavior, which is very stressful for the other dogs. Having read the above, you might now have decided to go out with your puppy and let her play with every dog you come across, in the hope that you’ll avoid the ‘deprivation increases motivation’ problem. Many owners do this anyway, because they have been told about the importance of socialization. They believe they are doing the right thing to allow their young Labrador puppy to play with every dog she sees. The puppy is having a good experience with other dogs, right? Ironically, this approach may also cause the same problem! How Do These Risk Factors Create Over Friendly Dogs? If a Labrador comes from a single-dog household, and once a day is taken out and meets other dogs for rough play on a walk, what happens? Typically, the most exciting thing on the walk becomes other dogs and the Labrador is on the lookout for them! When a playmate is found (who happens to also enjoy rough play! ), the owners stand there and watch their dogs mauling and throat-tackling each other and wrestling. Eventually the owners separate their dogs (who still want more), and go their own ways. What has the Labrador learned, in encounters like this? Rough play is wildly exciting and the most motivating thing around. Rough play is what you ‘do’ with other dogs. When you see another dog, go and get that play! Once you’ve learnt that ‘deprivation increases motivation’, it’s easy to conclude that the solution is to give your dog so much play, he’ll get bored of it and want no more. But it’s important to note here that the dogs in this example still wanted more at the point of separation. So – ‘satiety’ wasn’t reached. They didn’t get their ‘fill’ of play to the point where the appeal wore off and they had had enough of it. Instead, play stopped at the apex of excitement and at the point where the Labrador is likely to remember other dogs as ‘wow’. When I help people who want to create more motivation for tug toys, I advise handlers always to stop playing at the apex of excitement and put the tug away. In reality, it is hard to provide play to the point of satiety. The other owner typically isn’t able to wait for an hour or more, and wants to walk on, after a short while. The play will frequently get stopped at the apex of excitement. So frequent rough play is to be avoided. Continuing excessive rough play with other non-household dogs outside of the socialization period is also to be avoided. Wait until your puppy is over the age of 14-16 weeks, and appears to be well-socialized and generally happy and confident. Now is the time to hugely increase training and control in the presence of other dogs and to decrease frequent rough play with other dogs, particularly dogs encountered on walks. Teach your dog, from puppyhood onwards, that other dogs encountered on walks don’t often result in amazing play experiences. Associate the presence of other dogs, with control and focus on you. Use a 10m long-line trailing on your dog, until you know you have absolute responsiveness to cues. Train your puppy in the presence of other dogs. Your puppy doesn’t need to go and see dogs you pass on a walk. But if you want your Labrador to greet dogs sometimes, put this behavior on cue. That way, without the cue, the dog should understand that a meeting is not going to happen. Say ‘Go Say Hi’ and then permit your dog to greet the other dog (assuming the other owner consents). Don’t do this with every dog you pass, or even with the majority of dogs – this is the exception, rather than the rule. If you see excessive interest in the other dog, that’s a sign you need less ‘go-say-hi,’ as it suggests your puppy is anticipating the release. 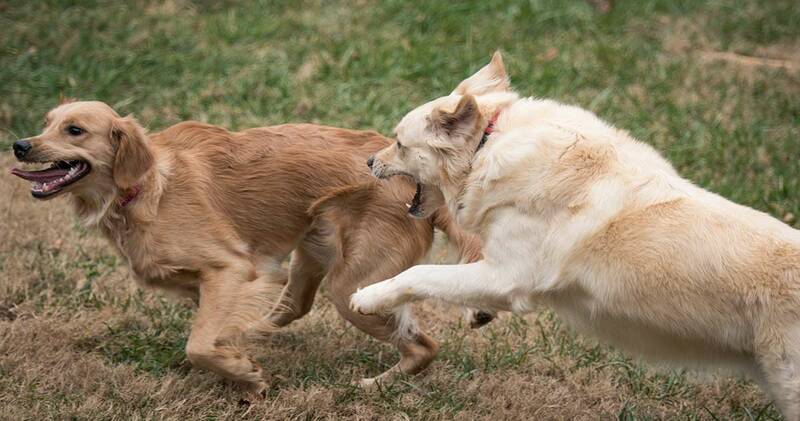 If you are feeling mean about depriving your dog of dog-dog rough play, consider inviting dogs that you know appreciate this sort of play over for a play date in your yard. In this way, the ‘rough play’ idea tends to be associated with a particular setting – your house/yard – and it isn’t ‘looked for’ during a walk. There is no substitution for a really well-adjusted and well-socialized adult dog, when it comes to raising a puppy and installing excellent social skills. To some extent, if you have a single-dog household, you just can’t completely compensate for the lack of this. But you might have friends or family with just this sort of dog, and you might be able to meet up frequently so the dog becomes a sort of ‘grandparent’ for your puppy! I would recommend this isn’t done on a ‘walk’, but again that you go to each other’s houses. That way, if the puppy becomes too obnoxious for the older dog, you can easily separate or stop the interaction – not so easy in the middle of a walk. The older dog should not be pushed to the point of telling the puppy off, do separate before that happens! My Over Friendly Dog Is A Bully – What Should I Do? It may be difficult to fundamentally change your dog’s play-style, personality and communication skills. But it is never too late to teach your dog self-control around other dogs, which will achieve the same thing in terms of a hassle-free existence for you. Rather than me attempting to describe detailed training exercises, here, I’d urge you to check out ‘Control Unleashed’, by Leslie McDevitt. ‘Control Unleashed’ is a system of training which focuses on achieving control around high distractions. I especially recommend the DVD set called ‘Control Unleashed: Games Demonstrations’, and the Control Unleashed Puppy book – even if you have an older dog. Once you’ve installed some Control Unleashed games by working them at home and away from distractions, find a place where other dogs are likely to be on-leash (not off-leash), and passing by. Pick a distance that your own dog can cope with and still easily respond to you at. Use your Control Unleashed exercises. If people attempt to move closer to you with their dogs, abandon any concern for social politeness and walk off with your dog. This will avoid the complete loss of self-control that will likely arise for your dog if they keep walking nearer! Over time, your dog will get better at these ‘games’ and be able to focus on you in closer proximity to other dogs. Teach a reliable recall! Pippa Mattinson has a great step-by-step recall training book here. And I also have a 5 week online Reliable Recall course, which is accessible worldwide here. Seek out a reputable and accredited force-free trainer and continue, long-term, at training. When I work with clients whose dogs are like these, they typically complete just my entry-level 6 week course. Sometimes, they are so fed-up of having the high-energy ‘I want to get to every other dog’ dog in class that they don’t even finish the course. It’s not going to be easy, but if you want to fix it, you have to keep going. Avoiding the problem is not going to make it go away! You will make progress. Every experienced trainer has encountered dogs like yours a million times before, so please don’t feel embarrassed. If you own a sporting breed such as a Lab or a Golden Retriever, consider taking up some gun dog training! This is a good idea whether or not you want to train your dog to be a working gun dog. The great thing about gun dog training is that it is exactly what your dog needs to learn: To focus on you, in an outdoors environment, around other dogs. For other breeds look for outdoor classes where your dog can learn how to interact appropriately with other dogs. Working Trials and Agility are also good sports to get involved in. But being outdoors is the key. Other sorts of obedience and pet dog training classes are typically indoors. It’s easy for a dog to conclude that play with other dogs isn’t accessible in this indoors setting, so there’s no point trying to access it. But they may think that being outdoors equals rough play with every dog on the horizon. Teach your dog this is not the case, by training for focus and responsiveness in the very situation that you need it – outdoors, with other dogs around.